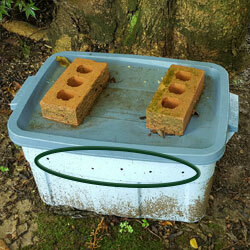 Most plastic worm bins have a catchment tray under them. Excess moisture seeps to the bottom of the bin. Your worm bin might also have a spigot, making it easy to drain excess leachate. Every time you feed the worms, you add moisture to the worm bin. Kitchen scraps are mostly water. When the worms and microorganisms in the bin break down the scraps, they release water and carbon dioxide. Water vapor condenses inside the plastic container. As the excess water trickles through the bedding, it brings some nutrients with it. The resulting dark water is tempting. It looks like a great source of fertilizer for your plants. Unfortunately, this leachate often contains a bad mixture of microorganisms. Left in the dark without the worms and bedding, the bad organisms reproduce. Leachate might also contain too much salt for your houseplants. Thus, worm bin leachate is a poor fertilizer. If you see leachate accumulating in the bottom of your worm bin, you need to drain it. Drain it as needed. Or, if the bin has a spigot, leave it open and place a container underneath. Empty the container regularly. Leachate can be a sign that your worm bin is too wet. The worm bin bedding should have the consistency of a wrung-out sponge. Test this. If it is too wet, the worm bin may start to smell bad, and the worms could get sick. See our article about wet worm bins. It may be possible to re-use the leachate by diluting it with 10 parts water to 1 part leachate. You could use the bubbler for 24 hours (see below). However, your best bet is to discard the leachate. Pour it down the sink or toilet, or dump it on the driveway. If you decide to re-use leachate, apply it only to decorative plants. If you’re looking for an easy-to-apply liquid fertilizer for your plants, make worm tea instead. Worm tea requires little effort to make, and it’s very convenient to apply. 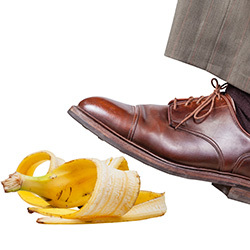 Worm castings, or worm poop, is filled with valuable microorganisms, especially when it is fresh. You will need about 10 gallons of water. If your water contains chlorine, dechlorinate it by letting it sit for 24 hours. Harvest about a pound of worm castings from your vermicomposting bin. Place the worm castings into a mesh bag, stocking, or long sock. Tie it at the top. Put the bag of castings in a 5-gallon bucket, and add dechlorinated water until it is nearly full. Add 1 Tablespoon of molasses or other sugar. Then, place an aquarium bubbler in the bottom. Plug in the bubbler and let it run for 24 hours. This adds oxygen and encourages helpful bacteria to grow. Remove the bubbler and bag. Mix the worm tea with another 5 gallons of dechlorinated water. This worm tea can be poured directly on the soil at the base of the plants. You can spray it on your garden or lawn. 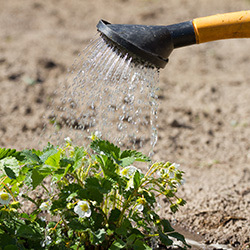 This nutrient boost will help your plants grow. 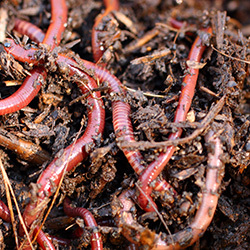 Uncle Jim’s Worm Farm is the #1 supplier of composting worms in the United States. We grow our own composting and fishing worms, and mealworms, on our farm in rural Pennsylvania. We also offer composters and accessories. Follow us on social media.